In 2010, Children’s Hospitals and Clinics of Minnesota underwent a renovation at its Minneapolis facility. The goal was to transform the entire location into a place where patients and families – who previously received care in a shared-space environment – would enjoy private, family-centric rooms. Such a renovation would also transform the way staff worked together. Minnesota Children’s used the project as an opportunity to reevaluate its entire workflow and communications infrastructure. 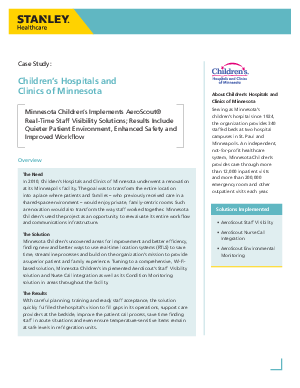 Read this case study to learn how Minnesota Children's Hospitals and Clinics of Minnesota implemented AeroScout® Real-Time Staff Visibility Solutions to achieve a quieter patient environment, enhanced safety, and improved workflow.